Vacation? Hiatus? Lazy? Call it what you will, but I can’t believe that I didn’t have a single post in August. Shame on me! This summer has been filled with a lot of fun and easy meals at home. I apologize for not posting in weeks! What have I been doing besides some traveling and enjoying the summer sun? I’ve still been scouring magazines and Pinterest for new recipes to try and have found some real winners. 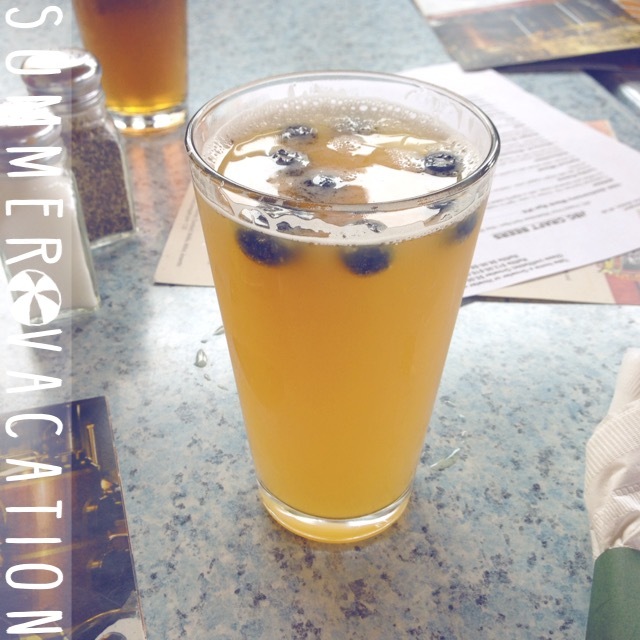 Blueberry Wheat beer from the Jameport Brewery in Ludington, MI. The only better thing on their menu is the Cheddar Ale Soup with ham bits and chunks of mustard flavored Snyder’s Pretzels! I’ve also been reorganizing my recipes and creating a new “cookbook” on my Google Drive. I spend a lot of time dealing with recipes I find in magazines: searching, tearing them out, sorting, cutting them, pasting them into one of my many binders… I thought that there must be a better, easier way to deal with all of this information in today’s electronic era. So, I still search and tear. I even do a little cutting if necessary. But now, instead of putting them into a binder and hoping that I can find them later, I’m scanning my recipes, filing them, and uploading them to the cloud! It’s so much quicker to organize my recipes now. It also makes meal planning much easier. Need ideas? All I have to do is look at my phone! No more pulling out cookbooks and binders and lists… Hooray! As you may know, Evan and I did a cleanse this past winter: The Conscious Cleanse. While we don’t stick to the cleanse guidelines strictly today, we do still follow some of the main principles. One of the big changes we made was what we eat for breakfast and lunch. This requires planning, but after several months, we’ve got it down. Every night after the gym and a shower, one of us tackles the following day’s green smoothies (breakfast) and big ‘ole salads (lunch). The Chopped Italian Salad has become one of our favorites, so I thought I would share it with you all today. This recipe will make two large lunch salads. We pack ours in 64 ounce plastic containers. Are you ready? 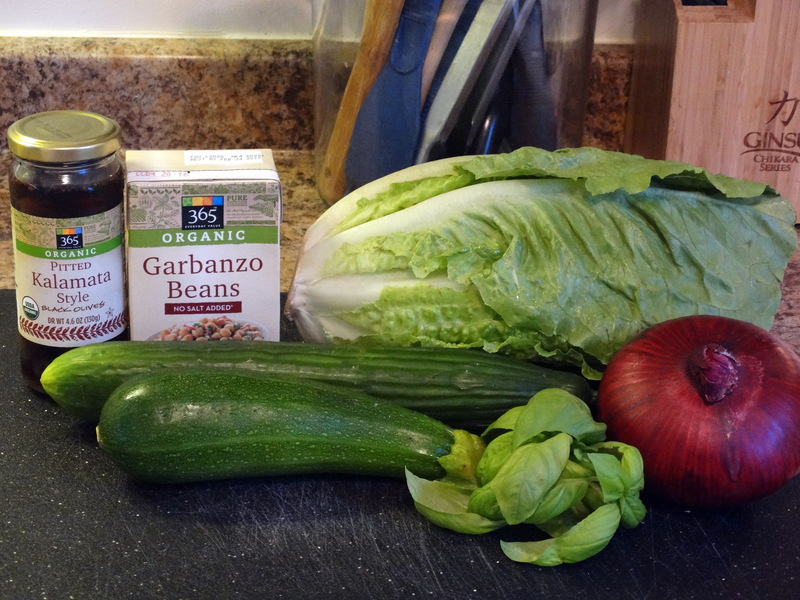 You will need a head of romaine lettuce, a cucumber, a zucchini, a red onion, kalamata olives, chickpeas, and fresh basil for the salad itself. The dressing requires honey, Dijon mustard, freshly squeezed lemon juice, olive oil, garlic, dried parsley, oregano, and basil, along with freshly ground salt and pepper to taste. Start by washing all of your fresh ingredients. Chop one whole, large head of romaine lettuce. Divide into two 64 ounce traveling containers. Chop half of a cucumber and zucchini. Add to your salads. Next, thinly slice half a cup red onion and halve approximately 16 pitted kalamata olives (I like to use 8 olives per salad…Evan likes more). Divide these between your salads, then top each with 1/4 cup canned chickpeas and a bit of freshly sliced basil. Now you’re ready to make your dressing. The dressing recipe should yield about 1-1/2 cups. You won’t need all of this for your lunch, so get ready for tasty leftovers! Combine 1 tablespoon honey, 1 tablespoon Dijon mustard, 2 tablespoons freshly squeezed lemon juice, 1 cup olive oil, 2-3 cloves minced garlic, 1/8 teaspoon dried parsley, 1/8 teaspoon dried oregano, 1/8 teaspoon dried basil, and salt and pepper to taste in a small lidded container. Shake to combine. 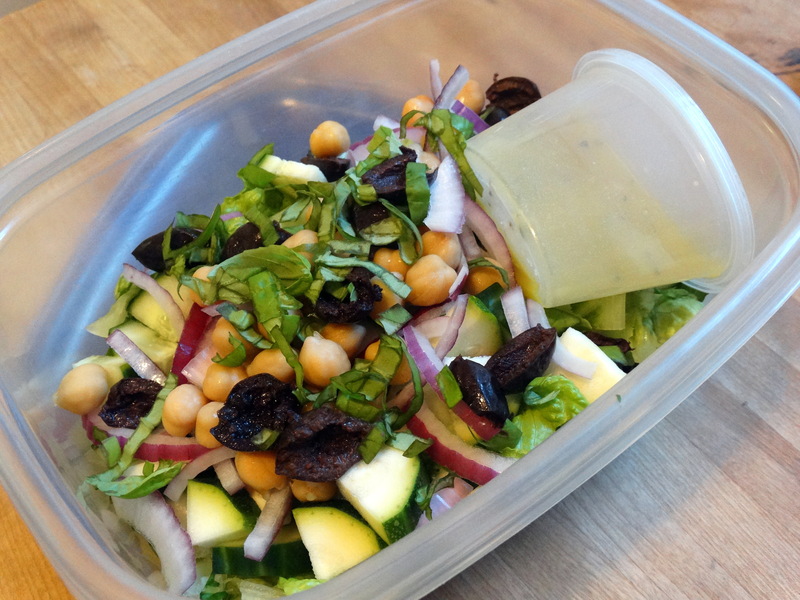 Using a tablespoon measure, add 2-3 tablespoons of the dressing into two small plastic containers and seal, unless you are eating your salad right away (see below). When you are ready to eat, top your salad with the dressing, and enjoy! The leftover dressing will keep in the refrigerator in your closed jar for a week. 1) Wash all of your fresh ingredients. Chop one whole, large head of romaine lettuce. Divide into two 64 ounce traveling containers. Chop half of a cucumber and zucchini. Add to your salads. Next, thinly slice half a cup red onion and halve approximately 16 pitted kalamata olives. Divide these between your salads, then top each with 1/4 cup canned chickpeas and a bit of freshly sliced basil. 2) Combine 1 tablespoon honey, 1 tablespoon Dijon mustard, 2 tablespoons freshly squeezed lemon juice, 1 cup olive oil, 2-3 cloves minced garlic, 1/8 teaspoon dried parsley, 1/8 teaspoon dried oregano, 1/8 teaspoon dried basil, and salt and pepper to taste in a small lidded container. Shake to combine. 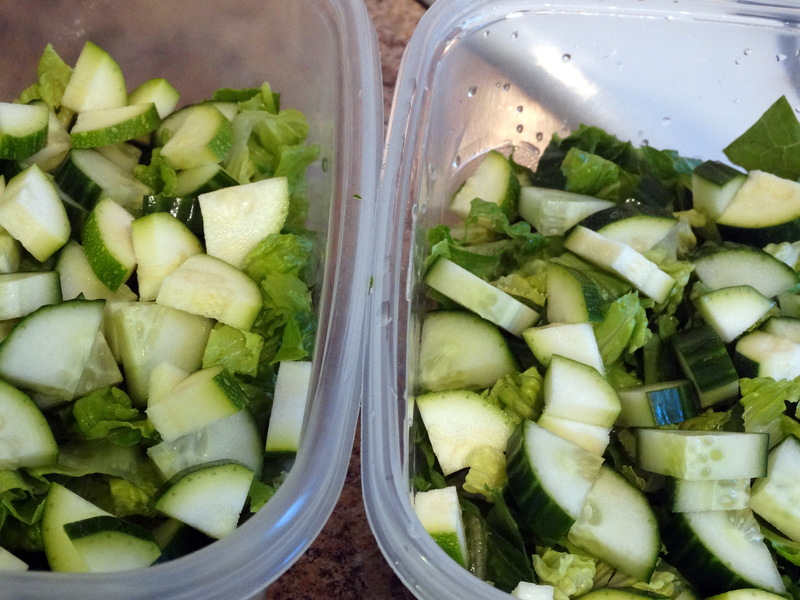 Using a tablespoon measure, add 2-3 tablespoons of the dressing into two small plastic containers and seal unless you are eating your salad right away (see below). 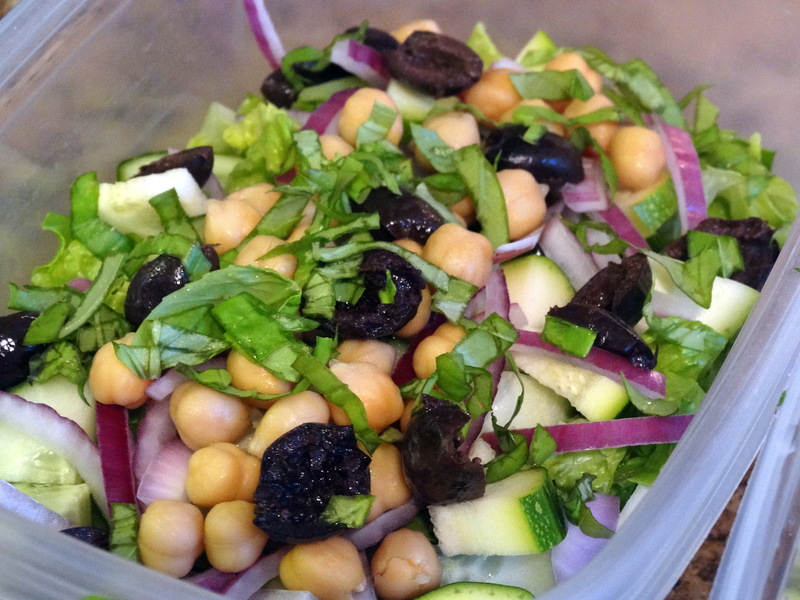 3) When you are ready to eat, top your salad with the dressing, and enjoy! *If you are using dried chickpeas, cook them according to package directions before adding them to your salads. I finally made it to your website. I am impressed by how organized your posts are and how you have put together all these recipes! I am a big fan of your meals and your joy for entertaining! It’s been wonderful so far! That sounds like my style! Your recipes are wonderful. I am definitely trying this one! Also, a tip… If my container lid is snug and tight, just before consuming I pour the dressing over all, then close it up and SHAKE IT to distribute evenly! I wish it were tomorrow already! Hi Cynthia! Olives kept in the jar with their brine will keep for 3-4 months in the refrigerator. An open jar of olives in our house never makes it that long though 😉 Some say they will last years, but that seems unlikely to me. Yes, we also like to shake up our salads with the dressing before eating!